No day out in the capital is complete without indulging in afternoon tea, the luxury lifestyle break every Londoner enjoys. The perfect foil to a day's hectic shopping or a full-on night out, afternoon tea is always an absolute must-do experience. So it's thrilling to be able to announce the launch of four new afternoon teas, each unquestionably London's best, exclusive to readers of this site. The only thing more scrumptious than tucking in will be deciding which of these innovative creations to pick first! Celebrate the new season with this delectable afternoon tea, full of magic, wonder and mouth-watering deliciousness. Two elegant finger sandwiches form the centrepiece of this vernal masterpiece, the absolute ultimate in fine dining. Each has been individually carved from the same slice of Chorleywood loaf, then separately coated with homespun spreads. One half is ripe with the full fruits of autumn, lightly scraped with pip-dusted strawberry jam, while the other half ripples with the intricate mountains and troughs of pitch-perfect peanut butter. No match of yin with yang has ever been bettered! 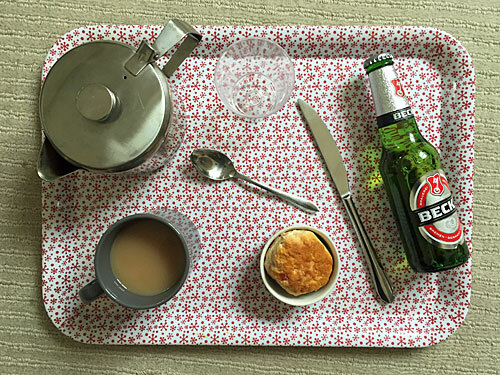 And yet the choice of beverage tops the lot. Lift the dainty china cup to your lips and let the intricately blended flavours of thirst-quenching tea soak within to refresh your innermost soul. No glazed macaroon sponges or twirly choc-dusted tarts have been allowed to intrude, maintaining the 100% health focus of this detox-friendly combination. 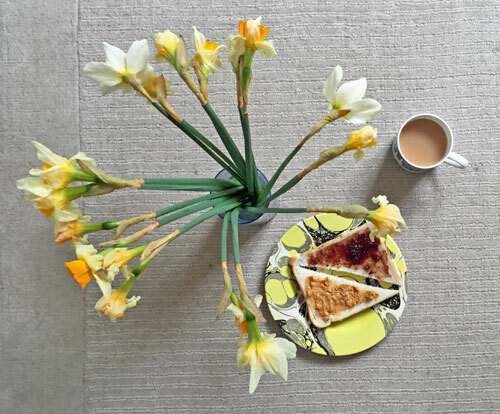 A burst of bold daffodils embrighten the experience, artfully swirled in a perspex vase, a few of the blooms not yet shrivelled to a soggy pulp. Tuck into this piquant platter of authentic rustic charm and you're guaranteed to feel spring has sprung. We'll see you there! Spring'n'Yang Afternoon Tea is served at Beau Church Rooms, E3. The price is £29.50 per person or £14.50 for children under 10. Carb-lite and wheat-free options are available. Find out more and book online via the website. Prepare yourself for a mealtime marathon of exquisite glamour inspired by everybody's favourite whimsical fictional character, as diners are transported to a themed world of fictional delight. Everything about this afternoon tea drips quality, from the hand-curated combination of individual nutritional elements to the sustainable hardwood breadboard on which the spread is arrayed. Only the finest leaf tea has been sourced, then delicately pre-milked and individually poured into a ceramic receptacle bearing the unmistakeable face of Purple Ronnie's Diamond Geezer. We're sold! Key highlight is a genuine part-wrapped Wagon Wheel, attractively nudged from its packet, revealing a lush strawberry confection in a dipped chocolate shell. Truly irresistible! 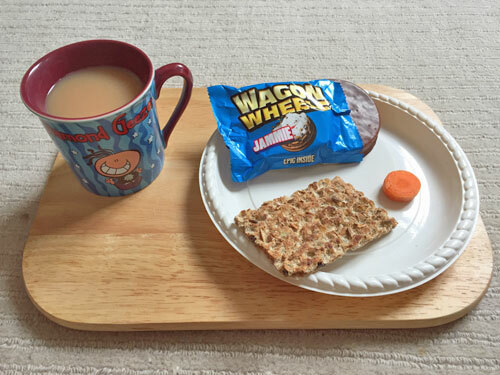 Clever chefs have paired this cocoa-coated disc with a granary-specked crispbread, untarnished by toppings, and rested it artfully on the rim of a ribbed microwaveable plate. But the pièce de résistance is surely the sleek micro-vegetable segment, a disc of pure savoury goodness, imbuing the overall experience with much-needed vitamins and minerals. No need to watch your waistline over your wallet, this treat's guilt-free! The Diamond Geezer Chocotastic Afternoon Tea is served at M'arrêt de Bus, E3. It needs to be booked in advance and costs £35 per person. Vegetarian and sugar-free options are available. Find out more and book online via the website. How's this for a unique spin on an old favourite? Cadbury's perennial chocolate egg inspires the fundamental rationale behind this gorgeous Easter celebration. 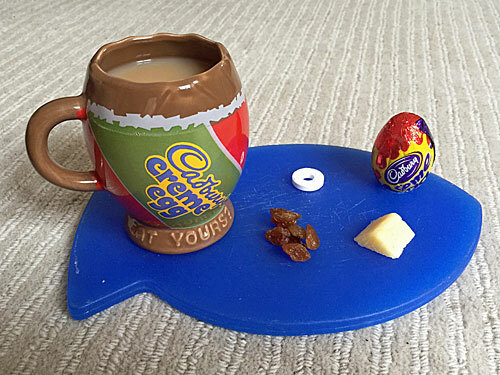 Not only is there a genuine Creme Egg to unwrap, but tea is served in an astonishing novelty mug whose appearance single-handedly justifies all expense. The mug's subtly iconic design harks back to the golden age of British-owned chocolate, the tight contours of its cross-section ensuring that only the most delicate amount of sepia-toned liquid can fit inside. At this time of year, with Creme Eggs suddenly almost impossible to source, the luxuriant decadence of this off-ration speciality cannot be understated! For maximal wellness balance, a sublime triptych of healthy nibbles accompanies the chocolate. At least half a dozen individual sultanas have been expertly stacked into a collapsed pyramid. A sophisticated wedge of processed cheddar has been sliced from the corner of a bespoke cheese slab. A single minty ring of Polo has been included as a palate-cleansing dessert, deliberately selected for its low-calorie centre. And the entire smorgasbord is laid out on a blue plastic chopping board in the shape of a fish, because that's quirky, and Instagrammable idiosyncrasy's where it's at. Count us in! Geezer's Afternoon 'Creme' Tea is served at Borode, E3. The price is £28 per person, or £48 with a glass of prosecco (optional). Vegan and low-fat options are available. Find out more and book online via the website. Here we go again. This time we've sourced an actual scone for you, but don't think we baked it ourselves, we have a go-to oven on a suburban trading estate in Ealing and then we defrosted it overnight. Sure, we've dropped it in a ramekin, but only because every gimmick counts, and a bit of light cocoa dusting would have allowed us to charge double. The tea is basically chopped up leaves in hot water, and costs us pennies, but my God the mark-up is exhilarating. But it's the alcohol which really makes our accountants sing, purchased in bulk at the wholesalers, and yes we are taking the piss. Please help me. I am an English graduate and qualified journalist reduced to generating puff pieces about overpriced hospitality options for a fickle corporate master. When I signed up I hoped to be writing wry social commentary and investigative exposés, but instead I'm sat here with my thesaurus pumping out a conveyor belt of toadying reviews. I don't get to visit the restaurants, I merely scrape the press releases, then add the pre-provided images before seeking editorial approval. I'd love to earn enough to be able to blow £40 on a couple of tiny sponges and a sandwich, but all the money's in flogging afternoon tea, not reviewing it. Posh Afternoon Tea is served across the West End. The price is whatever the hotel can get away with. Other forms of online journalism are available. Find out more and book online via the website.